Twice now, once in December of 2012 and again last month, approximately 150 people gathered at the northeast corner of Independence Mall, gave speeches both satirical and curtly political extolling the merits of ending the legal prohibition of marijuana, and at 4:20 p.m. lit and collectively smoked dozens of doobies. This Sunday, they aim to blaze one at the Liberty Bell again, and in contrast to the two previous frigid dates, where the glassy-eyed demonstrators largely had the National Historic Site to themselves, they’ll likely have a good bit of company due to fairer weather and St. Patrick’s Day festivities. 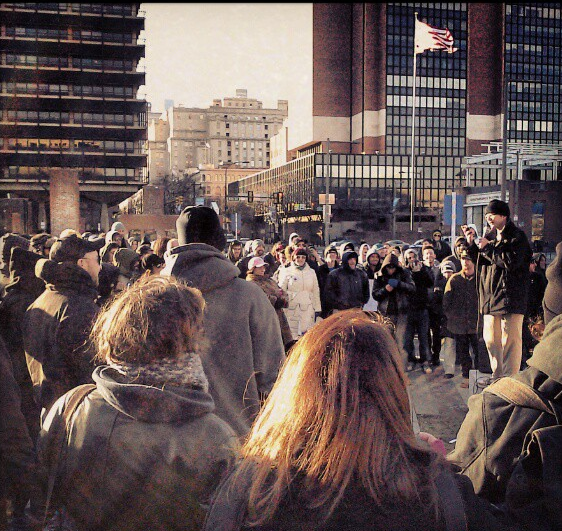 Organizers of the event, the Panic Hour and PhillyNORML, issued a press release concerning the demonstration and explaining what motivated their date selection. ‘We have chosen St. Patrick’s day, a holiday known for people’s excessive use of alcohol and belligerent behavior, to demonstrate the stark difference between behaviors associated with cannabis and alcohol users. It’s very clear to see that cannabis is safer. There have never been any deaths or overdoses associated with cannabis. And while thousands of Philadelphians get drunk and abuse alcohol on this day, cannabis, an herb which is known to treat multiple ailments and even cure cancer remains illegal. We hope these acts of civil disobedience will debunk stereotypes about cannabis and further our movement to legalize it in the Commonwealth of Pennsylvania,’ said Panic Hour organizers from their undisclosed bunker location. The purpose of the Smoke Down Prohibition events is to raise awareness about the social issues that are directly related to the prohibition of cannabis and support recent bipartisan moves to legalize the industrial production of hemp and establish a hefty federal pot tax. No arrests or citations were reported during the first Smokedown on December 15, nor was there any law enforcement involvement on February 9th when I attended (sober, as a member of the press). A US Park Ranger in an SUV observed from a distance by the Visitor’s Center, and the Philadelphia Police Civil Affairs officers on site never left their unmarked white Taurus (in 2010 Philadelphia made possession of small amounts of marijuana a summary offense, a move William Bender of the Philadelphia Daily News accurately described as “backdoor decriminalization,” which provides a similar monetary penalty as the federal charge). This Sunday, however, the sight and aroma of 100-200 congregants demanding pot legalization over a loudspeaker before cranking up the Reggae and smoking dozens of joints and blunts will likely be noticed by parents in line with their children to see the Liberty Bell. The Declaration will be on scene Sunday to bring you coverage of the demonstration. I was there, front and center for #2 and hope to be there for #3! As a former elected official but more importantly, an outspoken advocate and medical patient, I believe there is a serious injutice happening with this much too long prohibition! It is lang pass the time that Hemp should be our #1 renewable source for everything, but that cannabis should be legalized and provided just as this site has so well stated! You the reader, should note that we not only ask for what we want .. we are willing to give what the ‘other’ side desires! Tax Money! for the good of all! Legal lize now .. and please write your Representatives AND the White House! Stop the Injustice! Hey There. I found your bloog using msn. This is a very smarrly written article. I’ll bbe sure to bookmark it and come back to read more of your useful info.